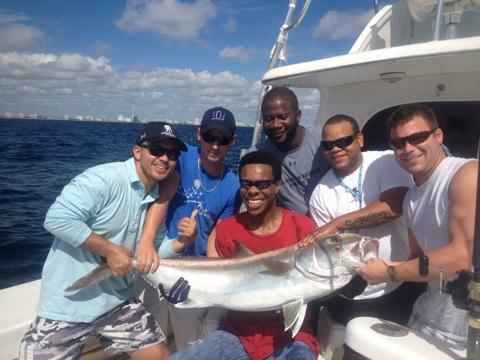 Incredible fishing the past couple days in Ft Lauderdale. Dolphin and wahoo are biting offshore, sharks and sailfish are showing up on the reef and good action on snappers and amberjacks around the local shipwrecks. 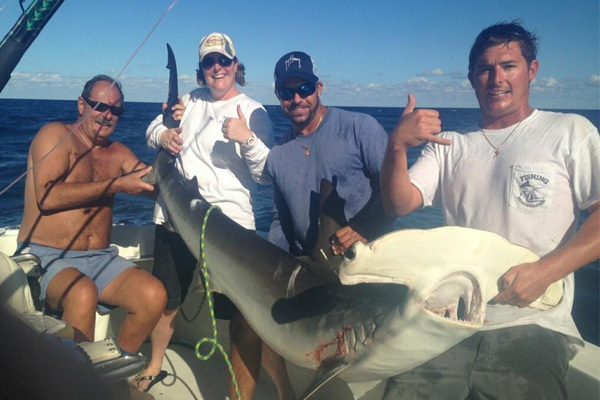 This is the season when our sportfishing trips really shine. I’ll start off with the sailfish bite. 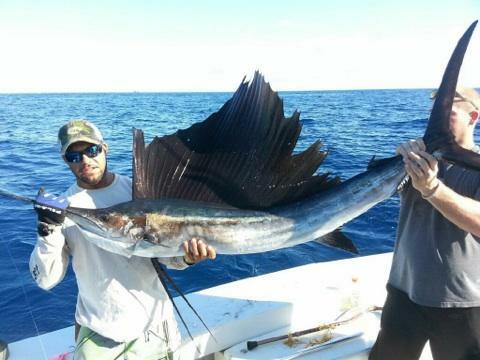 October is the beginning of our sailfish season in Fort Lauderdale. The numbers of sailfish we catch this season are better than any other time of the year. From now through January, when the weather gets cooler, the sailfish bite is excellent. We catch most of our sailfish in 100-150ft of water, which is about a mile off our coast. We call it “Sailfish Alley”. We catch sailfish by trolling or live baiting. The most effective sailfish technique is kite fishing, where we fly kites and dangle live baits. The live baits are suspended so that they are splashing on the surface of the water, creating vibrations that gamefish can pick up on using their specialized “lateral line” organ which senses fish vibrations. The splashing live baits bring in inquisitive gamefish from quite a distance. This is the best method to catching sailfish, sharks, bull dolphin and many other surface feeding gamefish. Today’s trip, we caught a monster hammerhead shark using this technique. This is an exiting way to fish, because you get to see the entire bite sequence. The big fish comes up to the surface and chases the bait around on the top of the water. There’s no way for the gamefish to get the bait into its mouth without sticking part of its body out of the water. In the case of big sharks and sailfish, he’ll have his dorsal fin fully out of the water, and his tail. Kingfish and barracuda actually skyrocket on the bait, jumping up to 15ft out of water, straight up, usually chopping the bait in half. It’s exciting to get a gamefish bite while kite fishing. Bottom fishing around the shipwrecks has also been good fishing action. 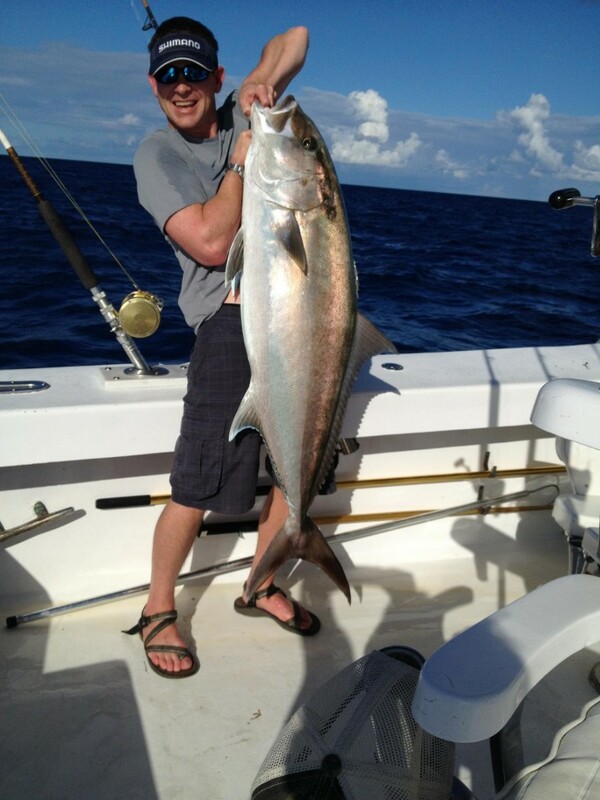 Amberjacks, which are a big game fish, are biting good this week. We catch these using live baits on heavy rods, dropping baits to the bottom. Vermillion snappers, a smaller fish which is excellent eating, are also biting good. We catch these around the wrecks too, dropping a multiple hook rig baited with squid chunks. You never know what else you may catch fishing around the deep wrecks. Offshore, the dolphin and wahoo are biting. 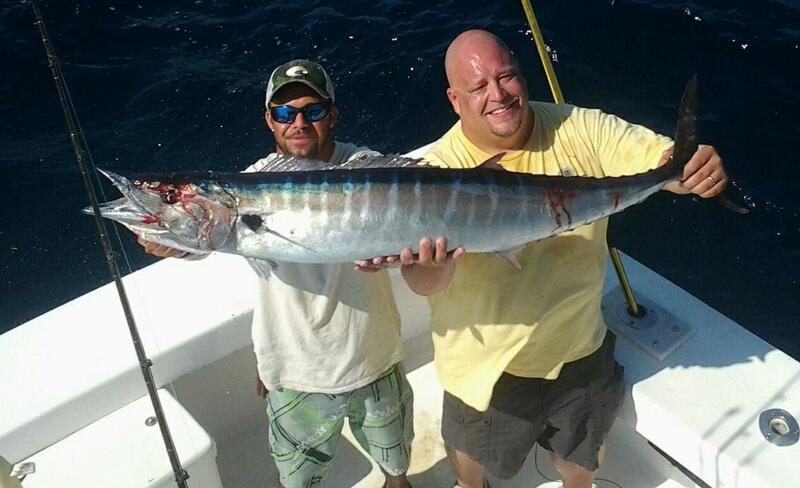 October is one of the top months for big wahoo and we’re just beginning to catch our first few. We caught a 30 pounder yesterday afternoon on our sportfishing trip. Dolphin are also showing up offshore. You can find dolphin trolling in the Gulfstream, especially near weed-lines and any floating debris you find. 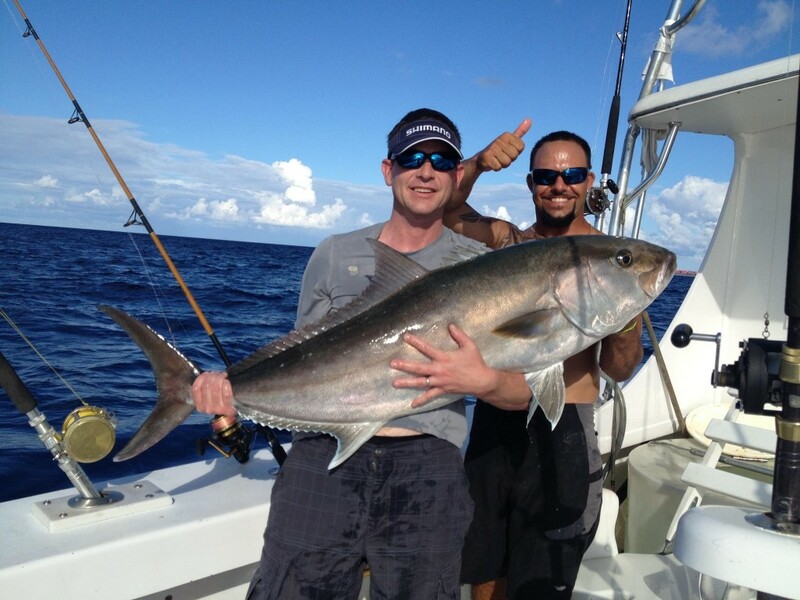 This is a great time of year for fishing in Fort Lauderdale. Good luck to everyone fishing with us this week. I’ll sea ya on the water. We had a great day of fishing today with Eric and Andy. Capt. Rod ran the trip and decided to do some bottom fishing around the wrecks. The amberjacks were biting great and big ones too! We caught a few nice amberjacks, a bunch of snappers and a couple nice sharks. We also did some Intracoastal fishing and caught some jack crevales, blue runners and some small fish we used for live bait. The weather was excellent and there was perpetual action throughout the day. Nice shark caught fishing with a live barracuda as bait in Ft Lauderdale. At one point, we caught a small barracuda and decided to use it for live bait. 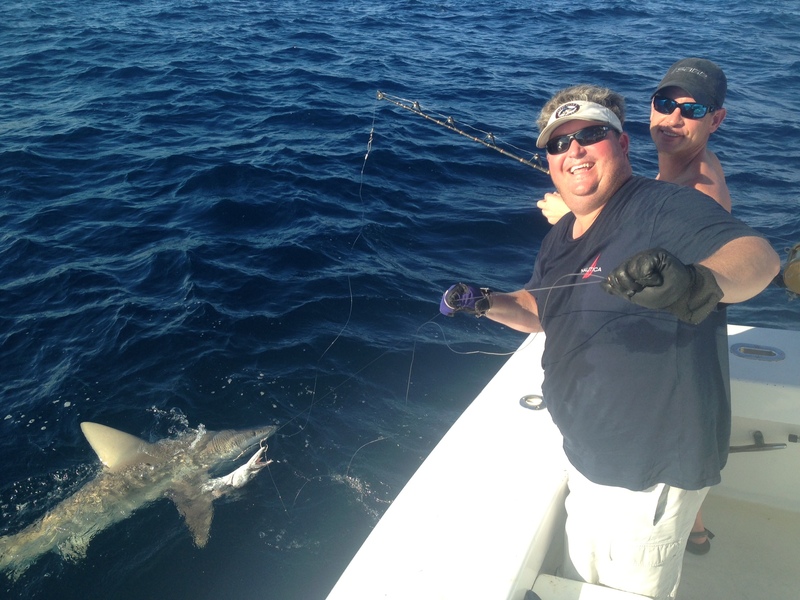 There have been some big game sharks biting this week and we wanted to see if we could catch one. We out the live barracuda down on the bottom, nearby a shipwreck in 200ft of water. It wasn’t long until the rod doubled over and we were hooked up. The shark ate the barracuda whole in one bite. We fought him for 20 minutes before getting him to the boat. We got some nice pictures with the shark and then turned it loose. 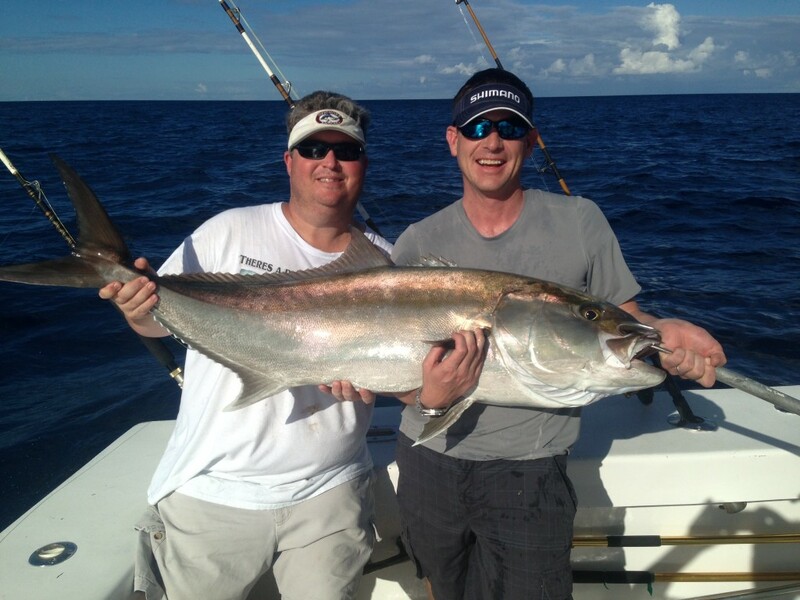 The amberjacks were big, 40+ pounders and they were eating our baits as soon as they hit the bottom. Amberjacks are aggressive fish and don’t let a bait sit unmolested for very long. Many fish will attack a bait on reflex when it comes into their vicinity, even if they aren’t hungry. Fishing near to the wrecks in 200ft of water is a great way to catch big game fish in Ft Lauderdale this time of year. Thanks Andy and Eric for a great day of fishing. It was a lot of fun to fish with you guys again. Can’t wait till you come back down our way again for some more carnage! 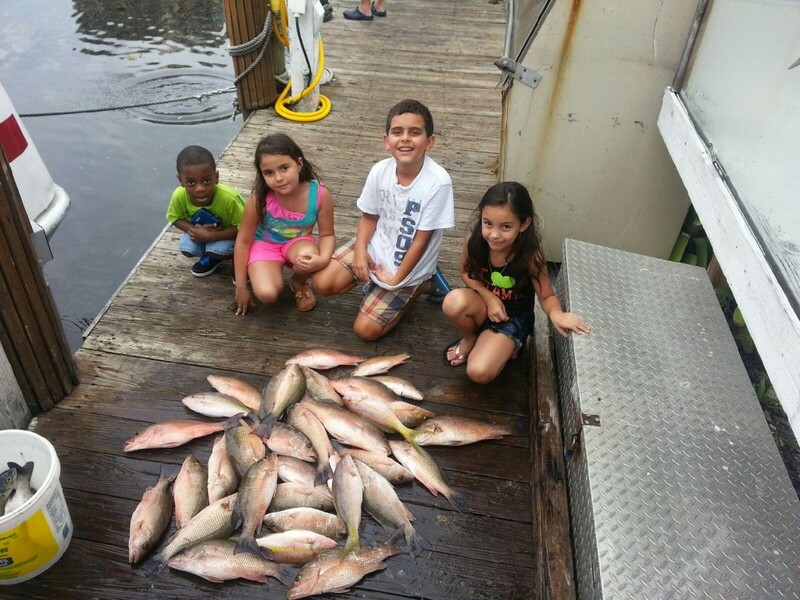 Nice catch of yellowtail and mangrove snappers fishing with these kids. It’s been a great week of snapper fishing in Ft Lauderdale this week. Shallow water snappers such as yellowtail and mangroves are biting good in 60-80 feet of water and deepwater snappers such as vermillion snappers (also known as B-Liners) are biting in 200-300 feet of water. It’s a great way for us to catch action this time of year and as you know, there’s no better eating fish than a red snapper! Some larger mutton snappers are biting on our daily drift fishing trips too, as well as a few groupers. 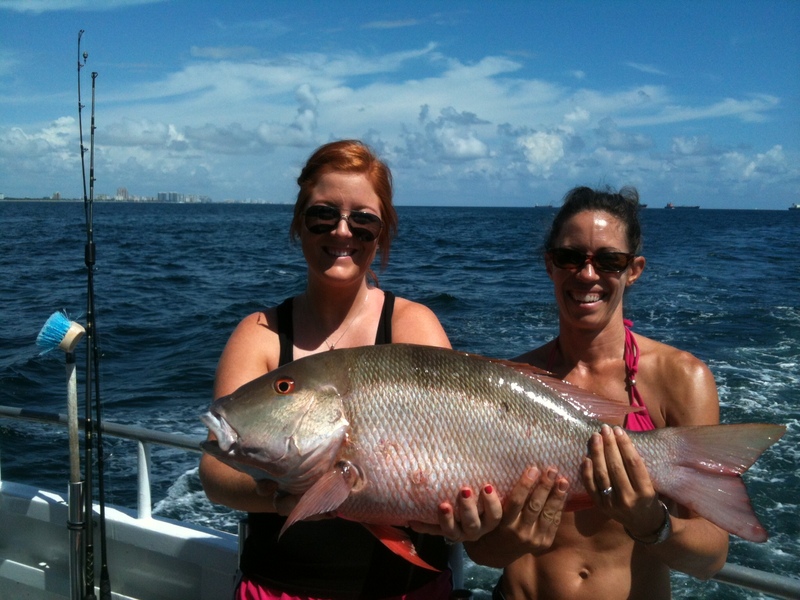 Mutton snappers are the larger snappers that we catch on the reef and average anywhere from 4-16 pounds. Groupers are biting in the same zone as the mutton snappers, most of them either black or red groupers with the occasional gag grouper too. On the drift boat, fishing the bottom for these deep water fish is the best ticket to catching action. 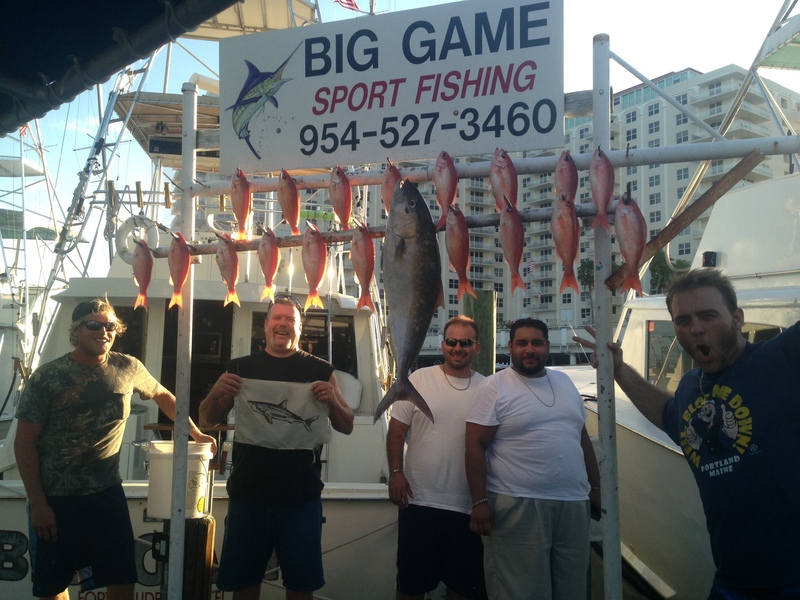 We took the Wounded Warriors out yesterday on a sportfishing charter and caught a nice array of fish. We caught several nice size amberjacks, approximately 15 vermillion snappers, a big almaco and a few other assorted bottom fish. It was a great day of fishing with America’s bravest! Thank you all for serving and I’m glad you guys got to catch some nice fish yesterday. It’s a great season for fishing Fort Lauderdale and as we get deeper into October, the fishing is going to get better and better. Good luck to everyone fishing this week, I’ll sea ya on the water.